ww2dbaseThe Prinz Eugen was launched in 1938 as part of an ambitious peacetime building program intended to bring the Kriegsmarine to equal terms with the Royal Navy. But in 1941 she commissioned into a fleet unprepared for war, facing a vastly superior enemy. ww2dbaseHer career epitomized the difficulties faced by the German surface fleet in WW2. Victories in the spirit of her namesake, Prinz Eugen of Savoy, would elude her. Her North Atlantic sortee with Bismarck and the sinking of the Hood in April 1941 earned her a place in history, but the destruction of the Bismarck left no real cause for celebration. The daring dash through the English Channel may have been a moral victory but it was no great contribution to the war effort. ww2dbaseAfter participating in Bismarck's Atlantic Sortie, Prinz Eugen returned to the port of Brest due to engine trouble. While at Brest, she was damaged by a bomb on 2nd July 1941 causing major damage. She was repaired in time to take part in Operation Cerberus, the famous 'Channel Dash' in February 1942. After this, she was transferred to Norway, but was soon torpedoed by the British submarine Trident on 23rd February 1942. Repairs were completed in October, and she was then used as a training ship in the Baltic until mid-1944. With the Russians advancing, she was then used for shore bombardment supporting the army until she surrendered at Copenhagen in May 1945.
ww2dbaseIn 1946, she was allocated to America, and was used as a target at the Bikini Atoll atom bomb trials, and later sank due to damaged received in the tests. ww2dbasePlease visit this website for an excellent collection of history and photographs on this ship. 1 Aug 1940 Helmuth Brinkmann was named the commanding officer of German cruiser Prinz Eugen. 13 May 1941 Battleship Bismarck and heavy cruiser Prinz Eugen conducted refueling exercises. 18 May 1941 Prinz Eugen departed for Operation Rheinübung. 19 May 1941 Heavy cruiser Prinz Eugen made rendezvous with battleship Bismarck off Rügen Island at 1200 hours. 20 May 1941 Swedish cruiser Gotland detected German heavy cruiser Prinz Eugen in the Kattegat at 1300 hours. 21 May 1941 The German fleet containing Prinz Eugen was spotted by a British Coastal Command Spitfire aircraft at 1315 hours in the Korsfjord. It departed Korsfjord at 2000 hours. 24 May 1941 Prinz Eugen engaged in combat with HMS Prince of Wales and HMS Hood alongside of German battleship Bismarck. She scored the first hit on HMS Hood. 29 May 1941 Prinz Eugen arrived at Brest, France. 1 Jun 1941 German cruiser Prinz Eugen arrived in Brest, France to join battlecruisers Scharnhorst and Gneisenau docked there for refits. 2 Jul 1941 While in the dock at Brest, France, Prinz Eugen was hit by a bomb during an Allied air raid. 11 Feb 1942 Prinz Eugen departed Brest, France as a part of Operation Cerberus. 13 Feb 1942 Prinz Eugen arrived at the Brunsbüttel North Locks of the Kiel Canal, successfully completing Operation Cerberus. One man was killed by British air attack during the operation. 23 Feb 1942 British submarine HMS Trident attacked German cruiser Prinz Eugen with a torpedo, destroying her stern with a hit. 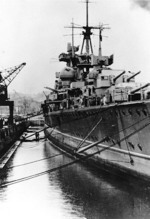 Prinz Eugen was able to later reach Trondheim, Norway for temporary repairs. 16 May 1942 Prinz Eugen departed Trondheim, Norway for Kiel, Germany to receive further repairs. 17 May 1942 The British RAF launched two strikes against German cruiser Prinz Eugen while she was sailing toward Kiel, Germany. The first wave of 18 aircraft reached the ship but scored no hits; 3 aircraft were shot down. The second wave of 30 aircraft was intercepted by German fighters mid-way; 4 British bombers and 3 German Bf 109 fighters were shot down in action. 18 May 1942 Prinz Eugen arrived at Kiel, Germany to receive a new stern, which was destroyed on 23 Feb by a torpedo from HMS Trident. 1 Aug 1942 Wilhelm Beck was named the commanding officer of German cruiser Prinz Eugen. 8 Oct 1942 Hans-Erich Voß was named the commanding officer of German cruiser Prinz Eugen. 28 Feb 1943 Werner Ehrhardt was named the commanding officer of German cruiser Prinz Eugen. 5 Jan 1944 Hansjürgen Reinicke was named the commanding officer of German cruiser Prinz Eugen. 15 Oct 1944 Prinz Eugen collided with light cruiser Leipzig by accident north of Hela (Hel, Poland) in the Baltic Sea, causing light damage. 8 Apr 1945 Prinz Eugen set sail for Copenhagen, Denmark. 9 May 1945 German cruiser Prinz Eugen surrendered to the Allied forces in Copenhagen, Denmark. 1 Dec 1945 During this month, former German Navy cruiser Prinz Eugen was renamed USS IX 300 of the US Navy. 1 Jan 1946 Arthur Harrison Graubart of the US Navy was named the commanding officer of the captured German cruiser USS IX-300 (formerly Prinz Eugen). 13 Jan 1946 USS IX-300 (former German cruiser Prinz Eugen) departed from Copenhagen, Denmark. 10 May 1946 USS IX-300 (former German cruiser Prinz Eugen) departed for Honolulu, Hawaii. 1 Jul 1946 USS IX-300 (former German cruiser Prinz Eugen) was a target ship during the Able atomic test of Operation Crossroads, sustaining light damage. 25 Jul 1946 USS IX-300 (former German cruiser Prinz Eugen) was a target ship during the Baker atomic test of Operation Crossroads, sustaining damage below the waterline. I have a Folttenkapitain Neubauer, as CO, in June 1942 in Keil, for the rebuilding of the stern, does your records or muster list bear this out ? he may have been the XO ??? Good Morning, I am doing research and I am looking for any quartermaster records for the Prinz Eugen. I have been in contact the German Navy Historical Office and was told all records for the Prinz Eugen were taken by the American Navy when the ship became a war prize. Any help as to where I could find such records is greatly appreciated. hello. to whom it may concern, I have an aquaintence who is the daughter of an US navy officer who was aboard the prinz Eugen on its wy to the pacific for bomb tests. in her possession are table ware, collision horn, blueprints operations amnuals etc.. in german for the ship as well as books and signatures of some of the officers of the german navy who went along. she is looking for a rputable buyer for the collection as a group for preservation. any leads would be helpful. how to contact "randy" on the subject of Prinz Eugen collectables?